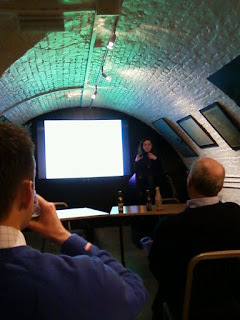 Always keen on drinking, I mean networking, I went to the IBD AGM at Fuller's yesterday. The main event was some talks on a recent study tour of Belgium, from which I learnt some fascinating facts, like Cantillon's beers now cost £6.50 for a small bottle and Stella has a lagering period of two days. 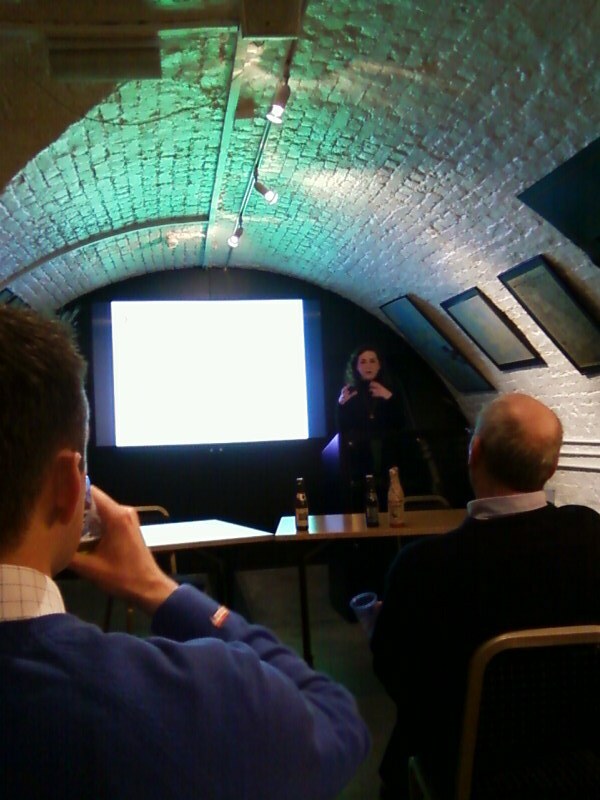 The lovely Lisa, who knows stuff about beer that isn't even boring, came along and was diligent in extending her practical and theoretical knowledge of beer. 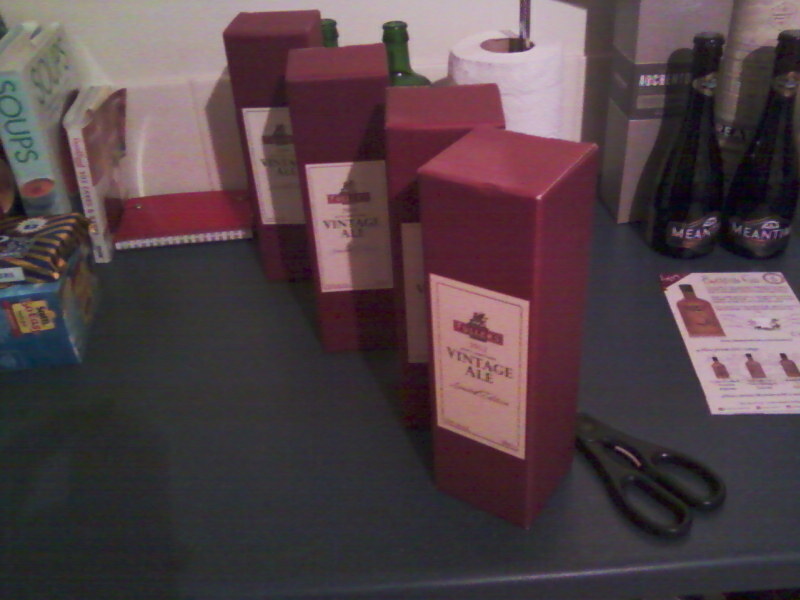 It was with the former that disaster struck. Plied with Vintage Ale by a Fuller's brewing big cheese she developed a taste for it. No sooner had we got home after the evenings hard studying when she dived into one of the beer cupboards and started rummaging around with my Vintage Ale collection. The lads have done it! That's it. I'm brewing AK 1911 again. Thanks to a tip off from Dave at work I've found more on Farnham Whitebines and the unresolved mysteries of the Mathon. On the Willingham Nurseries website is a PDF of the 1905 book The Hop and its Constituents by A C Chapman. To my delight it includes a couple of chapters by John Percival, author of the famous article from 1901 The Hop and its English Varieties. Once again he provides details of English hop varieties, but slightly annoyingly in the intervening four years he seems to have become less convinced that the Canterbuy, Farnham and Mathon Whitebines are exactly the same plant. Though to cloud the issue further being grown in different areas and probably harvested at different times would account for some variation. 'The main crop sorts cultivated in the best hop-growing districts are the Canterbury, Farnham and Mathon varieties, with the true Golding hop. These are similar to each other in many respects, and in all probability are genetically related. The Canterbury, Farnham and Mathon hops all have pale green or "white" bines, which grow to a great height if allowed. The Canterbury whitebine is largely grown in East Kent, the Farnham hop around the town of this name in Surrey, while the Mathon is the Worcestershire and Herefordshire representative of this class. The cones are of medium size, oval in shape, those of the Farnham hop being the least of the trio, the Mathon perhaps the largest, although there is not much difference in size. All have thin pale golden petals, rich in lupulin, and the flavour and aroma are all that is desired. On account of their delicate constitution they cannot be grown profitably except in the favoured districts where soil and climate are suitable. The Cobbs' Hop is a main crop variety of recent introduction. It is hardier than the Canterbury type with thin pale petals.It is an excellent cropper where the climate and land are satisfactory, but is generally not rich in lupulin. The "Golding" Hop resembles the Canterbury and Farnham types. It is often confused with these, and gardens supposed to be pure usually contain both Goldings and Canterbury Whitebines. I waited a long time for this book and it didn't disappoint. It's the second book in the Brewing Elements Series, yeast has already been done and water is in the pipeline. And to think I don't get paid for writing this stuff. As I've been doing a lot of research on hops myself recently I know the information isn't easy to find and books can be both old and expensive. So I have no hesitation in saying a new book of over 300 pages is really a must. Hop breeders and brewers from all the major areas have been consulted and just about everything that would be of interest to a brewer is covered, including hop aroma, hop history, hop growing, hop storage, a variety guide, the various ways hops can be used, and recipes too. Even the Farnham Whitebine gets a brief mention! It's easy to read and everything is covered in detail, except perhaps pellets and products but then they are well covered elsewhere . There are a few minor typos, but apart from that the only things I'd quibble are English farmers do currently grow male hops and Whitbread Golding Variety is not a landrace. It may only be January but already there's a strong contender for the Golden Pints 2013! I've had to raise an eye brow or two recently at the blogs of British craft brewers. Brewdog have been proudly showing off pictures of their big new craft brewery, which looks suspiciously like any other modern brewery: gleaming stainless steel, 40000 L cylindroconical fermenters, centrifuge, high degree of automation. All great kit I'm sure, and it should turn out a huge amount of beer with ease, but how exactly is it craft? "craft. noun . 1. an activity involving skill in making things by hand"
Perhaps the craft bit is the poorly painted murals on the office walls? Meanwhile over in Cumbria Hardknott Dave has been declaring cask beer to be obsolete, preferring a more modern alternative i.e. keg. Now adding CO2 from a gas bottle may well make for a more consistent product but how exactly does removing the importance of skilled cellarmanship and natural carbonation make beer more craft? Consistency is good but isn't beer served from kegs less craft compared to beer served from casks? Doesn't abandoning cask to get rid of the lows also mean getting rid of the highs? 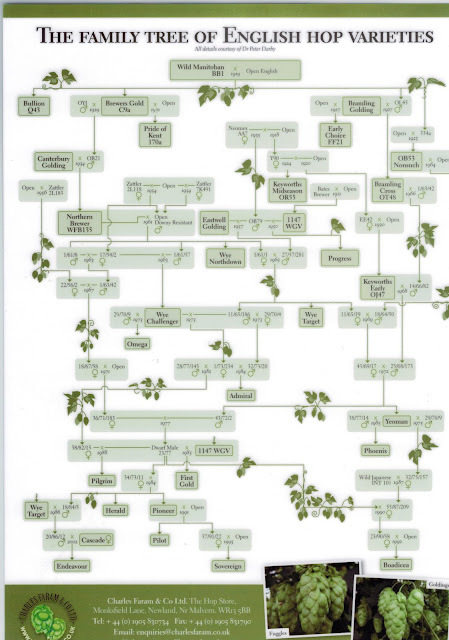 For those of you not lucky enough to be sent a Charles Faram calendar here's a scan of the goodie that came with it: "The family tree of English hop varieties". You'll notice that Fuggles only appear as a picture at the bottom and won't actually be found in the family tree. I forget the details but crosses made with Fuggle as a parent lacked a required disease resistance, though I've a feeling this may have changed recently (and Cascade, the American hop that's the mother of Endeavour, has Fuggle in its ancestry). Goldings have fared better and three of the Goldings clones feature in the family tree, but right at the top is BB1, a wild hop from Manitoba, a region of Canada, but that's another story.